THE smile beamed across Taylah Jennings' face as Rockhampton's latest world champion arrived home yesterday. The 17-year-old cyclist returned from the 2011 UCI World Junior Track Cycling Championships in Moscow, Russia, with two gold medals and a silver. Jennings exceeded expectations at her first junior world championships to become Australia's most successful rider at the meet by winning three of the country's nine medals. Jennings joined Georgia Baker and fellow Queenslander Emily Roper to win gold in the team pursuit after picking up a silver medal in the team sprint on the opening night of the five-day meet. However, the highlight of her world championships campaign came on day four. Buoyed by her gold medal-winning performance in the team pursuit, Jennings dominated the women's omnium to win gold in the individual event. Jennings won all six events – flying lap, 10km points race, elimination race, individual pursuit, 7.5km scratch race and 500m time trial – to find herself on the top of the podium for the second time. “It feels amazing. I think it was just that I really wanted to win and I know it might sound funny, but I thought about how good it would sound if I won every single (race in the omnium),” Jennings said. Coach Kenrick “Reggie” Tucker said he was delighted with Jennings' remarkable performance. 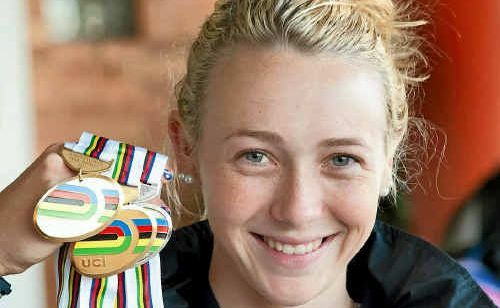 Jennings is Rockhampton's first junior female world champion since Olympic champion Anna Meares, who won gold in the 500m time trial at the world junior championships in 2001. “I'm quite thrilled about it. We did a lot of hard work before the championships and to her credit she's a fierce competitor,” Tucker said. With the multi-discipline event, Tucker rated Jennings' all-round performance as the best he's seen.